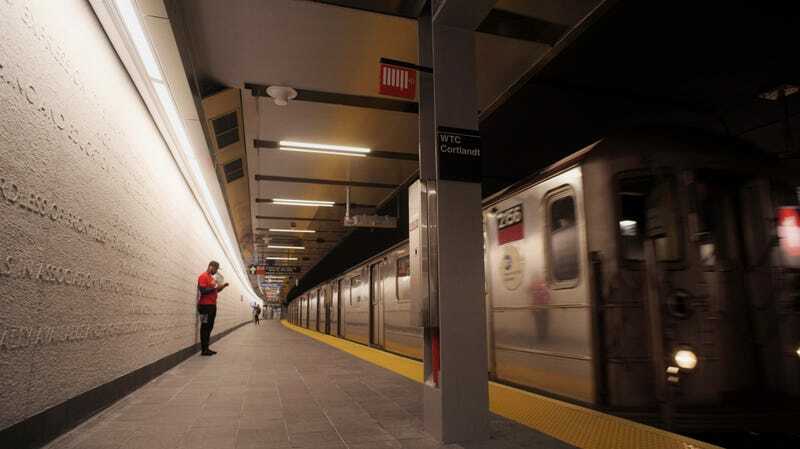 Nearly seventeen years after being destroyed in the terrorist attacks of September 11, 2001, the WTC Cortlandt subway station has finally opened to the public. The station will now be a stop on the No. 1 line and has been renamed WTC Cortlandt as a nod to Cortlandt Street, the street upon which the World Trade Center was later built. It began servicing the city at noon on Saturday, September 8. Construction on the station was delayed until the rubble could be cleared and construction was well underway on the surrounding buildings. The World Trade Center’s collapse destroyed the ceiling of the station, as well as 1200 feet of track on both sides of it. The $181 million project was well worth the wait, though, because the station is entirely revamped. Among other features, the station is experimenting with a new form of ventilation to keep the platform cool, local CBS news reports—something anyone will appreciate if they’ve ever had to use the NYC subway in the thick of summer. It’s also incredibly handicap accessible. And, on the aesthetic side of things: it looks very modern and features a mosaic of the Declaration of Independence and the UN’s Universal Declaration of Human Rights in honor of those who lost their lives in the attack. Bureaucracy and the poorly managed regional transit are the two big factors to blame for why reconstruction took so long, according to The New York Times. Construction was only able to start in 2015, when the Port Control of New York and New Jersey finally let the city take control of the project. And even then, the build was plagued with missed deadlines. And despite a year of crisis and setbacks on the subway, the opening of WTC Cortlandt speaks to positivity and, hopefully, change moving forward. This is the last major aspect of the city that required reconstruction after the attacks. That it’s finally complete—just in time for the anniversary of the attacks—speaks to the resilience of the city and their effort to turn a horrific event into a symbol of strength.